What Makes a Good Ferret Cage? Ferrets are cute, fun-loving creatures that have a knack for worming easily into their owners’ hearts. But before you adopt a pair, make sure there’s a roomy cage already waiting for them. Ferrets are ever curious. Due to their insatiable curiosity, they can be quite destructive. They will dig into your couch, climb onto your kitchen sink, pull books and whatnot off the shelves. Like toddlers, ferrets need to be heavily supervised when they are out and about. That is why you need a big, sturdy cage where you can put a variety of toys to entertain your pets. Most of all, a good cage will serve as your pets’ burrow, which they can call their own. However, the market is bombarded with a plethora of cages. How can you determine a good cage from a bad one? To make cage shopping a breeze for you, we rounded up the best ferret cages in the market. We made sure that these products follow certain criteria, which you can find in the buying guide below. The Black Feisty Ferret Cage by Prevue Hendryx is selling like hotcakes and it comes as no surprise. This ferret cage offers a good deal of living space for two chubby little ferrets. Even the most playful duo will find this cage spacious enough to run and play. Still, you’ll get plenty of room for their basic necessities and playthings. The Black Feisty Ferret Cage measures 31 inches in length, 30 inches in width, and 54 inches in height. This black ferret condo is complete with 2 heavy-duty plastic platforms, 3 wide reliable plastic ramps, 1 cute hammock, and a rust-resistant grille. This cage features two large openings since you have the option to separate it into halves. A feature like this allows you to separate the males from the females, particularly during mating season. The doors each have an escape-proof latch. You just slide it and pull it up to unlock each door. As for its debris tray, it is nicely moored underneath using a wind-bell lock. The rest can be removed handily to make cleaning as easy as possible. In addition, this black ferret condo has an easy-rolling stand for portability. Hence, you can easily transfer this humongous cage from one room to another. You can also find a spacious storage area at the bottom where you can stock up pet supplies. The Black Feisty Ferret Cage boasts of a heavy-duty wrought iron construction coated with a pet-friendly Hammertone finish. So, the cage won’t be a big eyesore! My only gripe is the cage’s backbreaking configuration. Some reviewers on YouTube even complained that some of the holes are misplaced and hence, you sometimes can’t screw the bolts properly. So, prepare an electrical drill just in case. 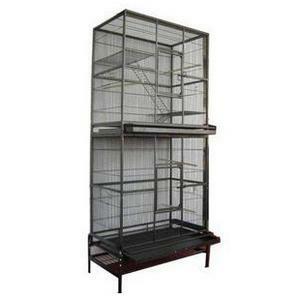 Nevertheless, the Black Feisty Cage by Prevue Hendryx is one sturdy ferret condo that could last for years. That’s why many fur-parents consider it as one of the best ferret cages in the market. 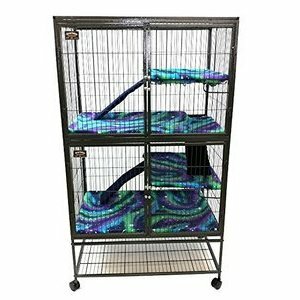 The Deluxe Critter Nation by MidWest Homes is a stand-alone cage ideal for two or three playful ferrets. It measures 36 inches in length, 24 inches in width, and 63 inches in height. Compared to product no.1, this cage is slightly bigger indeed. It offers ample space for your critters to roam around and play. Plus, you can stuff it with many toys to keep them abuzz. Inclusive of the 162 model, as it is also known, are 2 leak-proof platforms, 2 sturdy shelves, and 3 wide ramps. You’ll love the fact that the ramps have blue covers for traction, so your pets can climb their way up to the highest floor with ease and safety. This ferret cage also has ½ horizontal bar spacing. So, if your ferret wants to climb for a bit of mischief, he can, too. 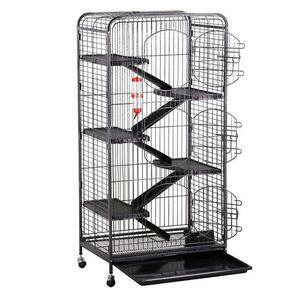 The Deluxe Critter Nation 162 offers a lot of customizability options than other cages. For one, both its shelves offer different height adjustments. So, instead of sticking with a predesigned enclosure, you’ll have the luxury to adjust according to your pets’ needs. Being able to do so allows you to hang various knickknacks and treats as well. Moreover, this ferret condo features full-width double doors to provide maximum accessibility, especially when it comes to feeding and interacting with your pets. 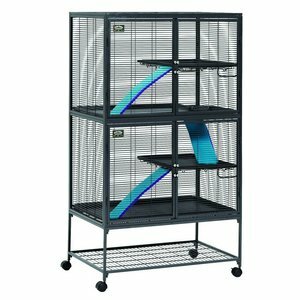 This makes Deluxe Critter Nation 162 inarguably one of the easiest cages to clean! It also features a lockable castered stand to help you move the cage around or to keep it securely in place. However, assembling the 162 model is easier said than done. The instructions did mention that its assembly requires no tools whatsoever. But once you have finally constructed the cage, you’ll see that putting it up is worth the sweat. With up to 6 levels to explore, your ferrets’ instincts for climbing will certainly kick in! 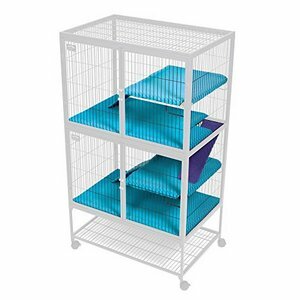 The Yaheetech 6-Level Ferret Cage was designed to serve as a hive of activity, making sure your pets get the exercise they need to keep themselves hale and hearty. 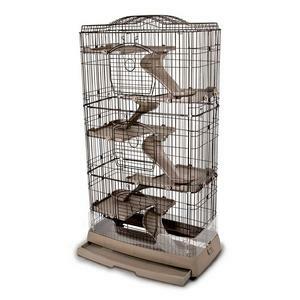 The Yaheetech Six-Level Ferret Cage measures 25.2 inches in length, 16.9 inches in width, and 51.6 inches in height. Likewise, this cage is complete with 5 platforms, 5 ramps, and 1 easy-to-pull tray. As you can see, this ferret cage is suitable for even the most energetic bunch. You’ll have plenty of room to hang as many treats and toys as possible to keep your furry pals entertained. In addition, this cage also has a free 8.5 oz. water bottle and a food container. By the way, the ramps are convex-shaped and feature a ribbed pattern to provide traction. This prevents your pet from slipping or falling. While this ferret cage serves as the perfect playpen, you might need a bigger cage that provides more floor space for two or more ferrets. Nonetheless, this cage features three front doors to make it easier for you to interact with your pet. All three doors have latches to make sure your pet is securely locked inside during your absence. Despite its size, putting up this cage is not an uphill struggle. In fact, you can set up this cage within 10 minutes or less. You don’t have to ransack your house for some tools. Nevertheless, don’t be rushed to judge that it’s a flimsy cage. 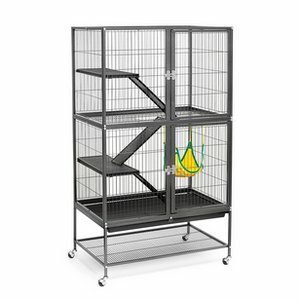 The Yaheetech 6-Level Ferret Cage is corrosion-resistant. Obviously, this is not a ferret cage. That may be so, but the Piggy BedSpreads fleece liner should be on your shopping list. Every ferret cage needs pet-friendly beddings. Although you can use corn cobs, recycled paper, wood pellets, or commercial beddings like Carefresh, they won’t be as economical as a washable bedding. What’s more, disposable beddings are quite messy, especially when the bottom shelf is shallow. The Piggy Bedspreads fleece liner, on the other hand, offers affordable and convenient solutions for your pets’ beddings. It features a pillowcase design, so it’s very easy to put on shelves and platforms. In addition, this product is premium quality. Your beloved pets will definitely love the soft and smooth feeling of fleece under their tiny feet. To top that off, these liners are available in chic colors and patterns, such as Northern Lights and Jacobean Flora. A lot of thought was given to the design of the Ferret Nation Habitat by MidWest Homes. Also known as the 182 model, this cage is designed particularly with ferrets and fur-parents in mind. This cage measures 31 inches in length, 25 inches in width, and 62.5 inches in height. Thus, this ferret condo can easily house 3 to 4 ferrets. You have the luxury to hang extra ledges for climbing, toys, wheels, and whatnot. The shelves can even be adjusted, too if you need more space for other knickknacks. Moreover, the Ferret Nation Habitat is complete with 2 leak-proof platforms, 2 sturdy shelves, and 3 wide ramps. Its ramps also have blue covers for traction to avoid injuries due to slipping. Its wide-expanse platforms and full-width shelves ensure each of your pets has enough room to frolic, chow down, as well as have a cozy spot for sleeping. In addition, this ferret condo features two full-width double doors. This makes cleaning a much simpler process. To top that off, you can clear the ramps by simply swinging it up and hook them in place. Doing so also allows you to create two separate sections. This feature is so convenient, especially if your pets aren’t yet neutered. Despite its size, the 182 model is not a nightmare to set up, which is good news. It also has a storage area at the bottommost for storing pet supplies. Who says ferret cages should look bland? Transform your ferret’s home from simple and boring to bright and fun with the Ferret Nation Accessory Kit 2. This kit is complete with a top pan cover, a bottom pan cover, three ramp covers, and a pair of shelf covers. The covers will ensure your little pal’s feet are warm, as well as provide traction so he won’t lose his footing. All items mentioned are made of high-quality fleece that is machine-washable and dryer-friendly. The covers each have Velcro straps that you loop around, so installation is a cinch. Bear in mind that the cage is not included. This cage is the junior version of product no.2, measuring 25 inches in length, 17 inches in width, and 37 inches in height. It features a steel wire construction with a powder coat finish to help withstand corrosion. You can choose between white or black. 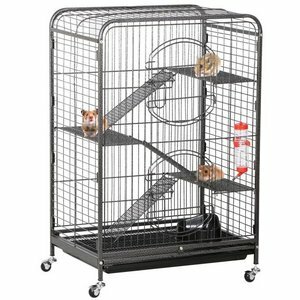 Moreover, the Yaheetech 37” Small Animal Cage has four levels complete with ramps. Likewise, there are two doors at the center, so you can access the cage or interact with your pets whichever level they are. 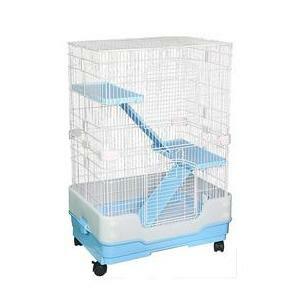 I would recommend you to opt for the Yaheetech Six-Level Ferret Cage if you have two pets or more. Ferrets love to climb as much as they love to burrow, so one of your priorities should be getting them more height space. This cage is fairly affordable. So, if you’re in a pinch, this could be the best option for you while you save for a larger enclosure. Know that this cage also comes with free stuff, such as a plastic water bottle and a food container. There’s also a bottom tray, which you can easily pull out for cleaning. With 4 universal wheels, transporting this cage to another area is a breeze. The Homey Pet 3-Tier Ferret Crate is one of the cutest enclosures you can get for your pets. This cage is available in three colors: baby blue, chocolate brown, and pastel pink. Likewise, this cage is among the easiest ones to assemble! You don’t have to ransack your garage for tools or stress yourself with a not-so-user-friendly manual. The Homey Pet 3-Tier Ferret Crate measures 26 inches in length, 17 inches in width, and 38 inches in height. So, it’s quite small compared to its counterparts. But if the budget is tight, you can use this crate to house one or two young ferrets, provided that you won’t stuff their enclosure with toys. On the bright side, it features a urine guard, which is inarguably the jewel in the crown. You won’t find a lot of cages with this feature. Having a urine guard effectively collects pet wastes to keep their home hygienic. My only gripe is that this cage has a plastic base. On the other hand, the wires are all metal and are finished with a pet-friendly powder coating to prevent corrosion. Standing at 5 ft. tall and 6 inches, the Ware Clean Living Cage is inarguably a huge enclosure. Likewise, the cage dimensions are 19 inches in length and 35.5 inches in width. So, there is plenty of room to stuff in lots of toys and other ferret paraphernalia. Your bouncy ferrets will also love going up and down all its 6 levels. The Ware Clean Living Cage has 3 doors on the front that are decently sized. It’s also complete with thick and sturdy plastic trays and ramps. The trays each have a clear splatter guard, which is helpful in containing the bedding. It also prevents water and food from being thrown out of the cage onto your floor by a rambunctious ferret. Its pull-out drawer is easily accessible. Assembling is a little time-consuming, which is inevitable for a huge cage. But on the bright side, you can adjust the position of the tray, whether you want it higher or lower. You just have to screw the bolts to your preferred height. While its tray and ramps are easy to clean, reviewers can’t say the same about the cage. You have to remove all the accessories and beddings one by one. If only its doors were slightly bigger, perhaps cleaning wouldn’t prove to be much of a chore. Its lack of storage is also another downfall. But for the price, you can get a huge ferret condo that can fit 3 to 4 ferrets. This may not be the fanciest ferret cage in the market but if you prefer functionality over bells and whistles, then you’ll never go wrong with this cage. It features a wrought iron construction that you can easily assemble despite that there’s no manual included. Each cage measures 30 inches in height, 18 inches in width, and 30 inches in height. If you stack both, you’ll get 74 inches in height including the stand. Its shelves and ladders are all metal, so you’ll just have to cover it with fleece to keep your pets’ dainty feet warm. Likewise, it also comes with a grille and drawer for each cage. Unfortunately, its stand does not have casters, so you better have a fixed location in mind for this prior to its configuration. Don’t you even think of housing your ferrets in an aquarium! This has to be the cruelest thing you could do to your fuzzy friends. Ferrets need a consistent flow of fresh air, that is why you need to get a cage for them that provides stability and safety. When it comes to getting an enclosure for your pet, a good rule of thumb is to get the biggest one your budget allows. You don’t want to make your pets’ cage to make them feel confined. Rather, their cage should empower them to express their individuality. 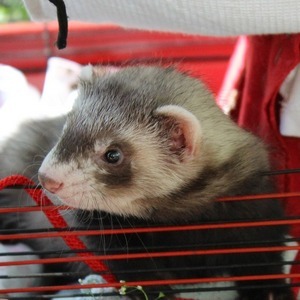 The minimum cage size for a single ferret is 2 cubic feet by 3 cubic feet, according to www.drsfostersmith.com. But a cage that small is only viable for transporting your pet to the vet when he’s ill. Size is a crucial factor, especially if your little ferret has to spend most of his time inside his cage, rather than foraging your kitchen for goodies. Ferrets need a specific place for their food, which logically, should be far from the litter box. Most ferrets avoid eating where they eliminate. 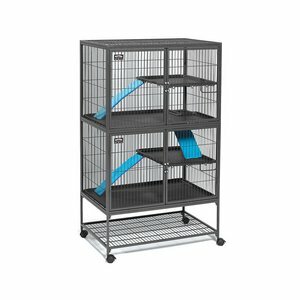 If you have other priorities such as studies or work, you really need to provide your pets with a large cage where you can store a lot of things to keep him abuzz. This includes tunnels, ropes, and toys galore! Otherwise, your happy pal will get bored and miserable. He could get ill. Remember, ferrets weren’t supposed to be caged animals. Despite their polecat ancestry, ferrets love to climb as though they were descended from monkeys. Whatever the case, be sure that your ferret’s cage features multiple platforms. Having multiple floors also allows you to separate his dining area, litter box, and sleeping space. Whether a stainless steel or a wrought iron construction is better, the answer remains a moot point among pet owners and self-acclaimed pet experts. Whichever you choose, make sure the mesh is at least one inch in size to keep your curious ferret from poking his head through. Otherwise, he could slip through or get stuck. Partial escape is such a frightening thing. Lastly, the floors have to be solid. If your chosen cage has a wired floor, make sure to cover it with a flat, solid surface so it is easier for your fuzzy pets to walk on. These two factors always come hand in hand. A cage that is not highly accessible is such a chore to clean. Choose a cage that has adjustable shelves, so you won’t have to remove all parts when cleaning. You also need to make sure that your ferrets’ cage has wide doors. The better if it has full-width doors, so you can easily reach and interact with your pets. But if you want to clean the cage from top to bottom, choose one that has casters so you can simply push the cage to your backyard. A good cage may cost slightly over your budget, but knowing your pets are safe and sound inside is worth every dime. Bells and whistles won’t make a good cage. The quality of the cage is determined by the materials used to the way its parts function. For instance, there’s no point of buying a cage that won’t even lock properly. Moreover, make sure the cage has no plastic coatings. Ferrets, like rats, love to nibble and bite on everything. Plastic coatings cause intestinal blockage or death due to poisoning. Choose a cage finished with powder coating. Powder coating is preferable than conventional paint since it is more durable. Likewise, it is resistant to scratching and chipping.